A riveting month-by-month account of America's first year. 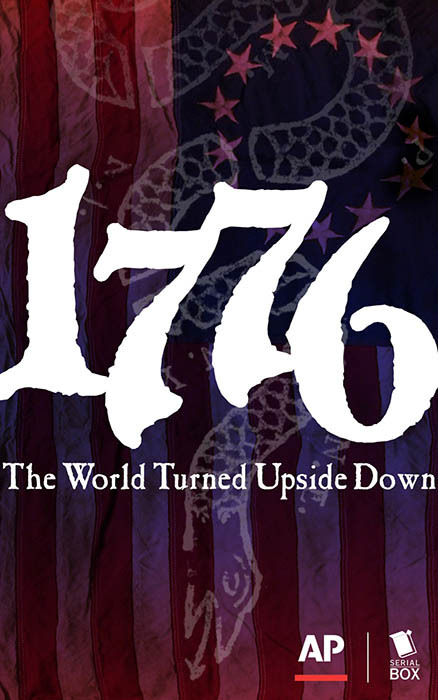 In collaboration with The Associated Press, Serial Box presents the nonfiction series, 1776: The World Turned Upside Down, a 12-part month-by-month immersive account of ordinary colonists during America’s first year. They were farmers and accountants, high-school dropouts and part-time soldiers, successful merchants and failed corset makers. Yet together they stood together and fought the greatest empire the world had ever known, all for a brand-new idea: America. A month by month immersive historical account of the Revolution in its first year, this series of twelve installments is unique in its focus on the lives of ordinary colonists and the more personal stories of now famous figures. Through informal and playful storytelling about the events in each month, the series explores the roots of America’s successes and many struggles. We see the beginnings of regional disputes and differences, institutional inequality and oppression, the tension between cultural heritage versus assimilation, and the struggle between states’ rights and federal government, all through the eyes of colonists and militiamen. The audio series is narrated by Robin Miles with a variety of guest voices including Hamilton star Chris Jackson as George Washington. Installments are being released in synchronized ebook and audio monthly installments from Serial Box throughout 2018.